The Mercedes Cooling System keeps your engine cool while it is running. The cooling fan has a direct effect on keeping your engine cool. 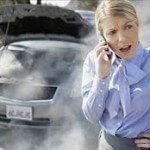 The cooling system is compiled of belts, thermostat, radiator and cap, heater, and coolant.To avoid costly engine repairs it must be checked twice a year to keep you car running properly and in good working order.The cost to repair cooling systems vary from model and kind of engine type. At time of service of your Mercedes, an inspection for any coolant leaks is performed to ensure that your engine has enough coolant. Rubber hoses can become brittle and split over time. Plastic parts such as your radiator and coolant reservoir can crack under the pressure of the cooling system and heat of the engine. If any of these parts are leaking it can cause the level of coolant to lower and not cool properly. At this time an inspection for internal leaks is also made to make sure that there is no coolant leaking into the motor oil or internal parts of the engine. In front of your car one or two cooling fan motors force cool, clean air into the engine compartment to keep the temperature in a safe zone . These fans are checked for proper air flow and functions. If there are any problems with these fans it will cause your engine to overheat. Attached to the fans is your radiator. This circulates coolant through series of small pipes that are cooled by the air flow from the fans. Checks are made to ensure that there are no blockages. The water pump is Mercedes Benz cooling systems heart. It is powered by belts and is attached to your engine. At time of service the pump is checked for leaks and to make sure proper pressure is holding in the system. Thermostats regulate the coolant from the engine back to the water pump and must be inspected to insure proper flow. The coolant reservoir and cap are also tested. A pressure gauge is used to check for normal pressure in the system and the coolant level is topped off if needed. When your Mercedes gets hot in South Florida German Car Depot is will keep you and your Mercedes cool.